Clare Furniss | It’s a wrap! Had a brilliant time at the Simon and Schuster offices this week doing some filming with with the wonderful Perdita and Honor Cargill, the mother and daughter team behind Waiting for Callback, for Maximum Pop! 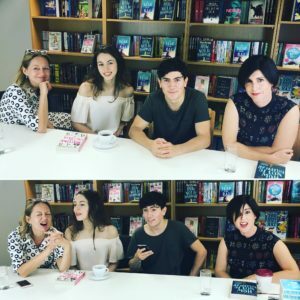 We had fun chatting, comparing notes, playing Heads Up (we were surprisingly good at this) and getting *extremely* competitive in a YA Quiz. Who won? Well, that would be telling… All will be revealed on Maximum Pop! soon. As you can see from the pictures we all took it VERY seriously!